Mughin has descended from his lair. If you can corner the old giant within the gem mine, perhaps he will disclose his greatest secret:L the location of the Crown of Destiny. This artifact, fund only in the oldest and strangest of myths, is said to allow one to control their destiny.It is time to reforge your past and cast off the uncertainties of the future! Bring legendary heroes and infamous monsters to your game with the Crown of Destiny hero and monster collection. Explore the unique strengths and abilities of these monsters and heroes by playing the e included quests individually or through the use of rumour cards. 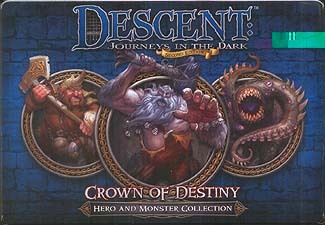 With 4 heroes, 3 monster groups, and 2 new quests, the Crown of Destiny hero and monster collection gives fresh options to your Descent: Journeys in the Dark game.